So I worked on this little project before Christmas and I sort of forgot to tell anyone about it. 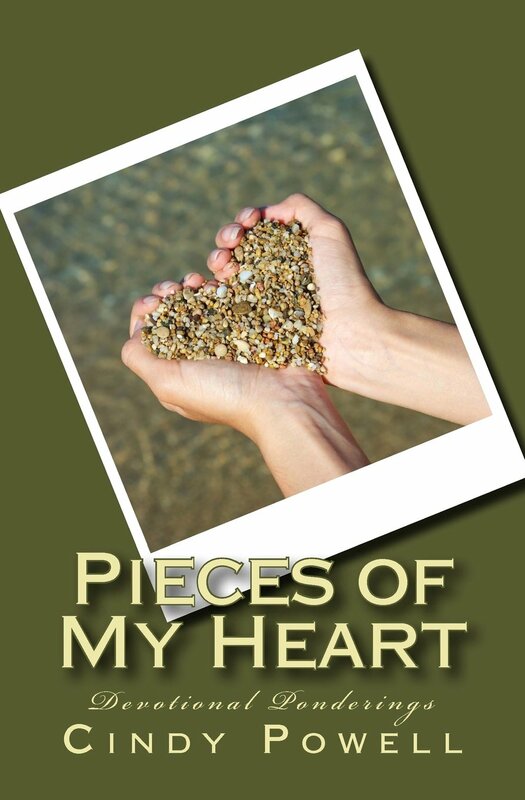 Basically, I’ve published another book called Pieces of My Heart. It was fairly easy to put together because I didn’t really write anything new–it is a (somewhat) random compilation of stuff I’d previously written. I like it because I did this one for me. Most of it was written simply to express my heart to Jesus (the majority of it has been published on one of my blogs). It is filled with the stuff I like to write. The stuff I sometimes like to go back and re-read, because when I do, I remember how I felt when I first wrote the words and they draw me back to His heart again. I think that is also why I’ve been a little reluctant to share it. I gave some copies to a few friends for Christmas and I was tempted to just leave it at that. I’m really not all that sure it is the type of thing other people (other than those who know and love me) will be all that interested in. Honestly, the whole thing feels sort of like an odd combination of both self-indulgence and sacrifice. Self-indulgence because I did it simply because I wanted to–there was no big higher purpose behind it all. On the other hand releasing it seems a bit sacrificial because this is my heart we’re talking about! It feels much safer to keep it to myself rather than take steps to share it, but I’m feeling prompted to let it go, so that’s what I’m doing. If someone is interested, it’s there–and if they’re not, that’s okay too. There is no real theme or consistent message throughout the book–except perhaps an ongoing longing to know Him and press into His heart. If you are looking for something with a beginning, a middle, and an end–this isn’t the book for you. I’ve subtitled it “Devotional Ponderings” because that about sums it up. These are the ponderings of my heart. There isn’t even a consistent style–there are some scripture meditations, a few devotions, some poems, some prayers, even a few simple allegories–along with a few I don’t even know how to categorize. Some are super short, others fill several pages. All in all–pretty random! They’re not chronologically ordered, in fact they’re not ordered any way at all–they landed in the order I happened to pick them out. I guess what I”m saying is that this book is not a comprehensive whole, it is a collection of pieces–pieces of my heart. Pieces of a heart that longs to know and honor the One who takes all of my pieces and makes me whole. Either way, may all the pieces of your own heart always find their home in His. going to order, have the other two..awesome inspiration to me! Congrats, Cindy! I have some ques about self publishing (assuming Simple Faith Press is you) and wondered what self publisher you used & what your experience was? Can we speak via email? I’m at kleach1227@gmail.com. PS: Love your cover and title. Really draws the reader in. Yay Cindy! I love that you said that when you read the things you’ve put in this book it brings you back to the feelings you had when you first wrote them. That has actually been my own prayer as I’ve read your book.That I will feel what you felt and that I’ll be taken where you went! I’m so enjoying it! I know, right? I’m a big Kindle fan myself. 🙂 But alas, it takes a bit of money to do it right on Kindle and since I couldn’t even make up my mind about whether or not I was going to tell people this was available for purchase, spending money to get it formatted properly for Kindle wasn’t exactly a priority! If you break your “one-click” habit, I hope you enjoy it–but if not, I totally understand, lol!